“Karla’s motivation and enthusiasm is infectious. I saw this when she was training other Clients which was the reasoning behind my decision to choose her for my journey. Karla spent time with me when we first met to understand what my goals were. My nutrition plans ensure I can enjoy still meals with my family, not missing out on foods but ensuring they are in line with the sustenance my body needs. My work and family life are really busy, and Karla has made sure my workout schedules means I am maximising the amount of time I spend in the gym and utilising everyday fitness such as weekends outdoors. My routines are changed when Karla is confident I am ready for a new challenging routine. Karla is very intuitive and seems able to sense my mood at the beginning of a session! Our PT sessions are always tough and rewarding – even if I don’t think so at the start! I have a lot of self doubt and sometimes it’s the last thing I want to do. But Karla has a rare gift to push me far more than I allow myself to. There have been tears sometimes and “I can’t do this” but her patience and perseverance means I always finish the session. I feel such pride and accomplishment when she has put me through my paces. I leave feeling re-energised, like I’ve soaked in a little bit of Karla’s personality and enthusiasm. 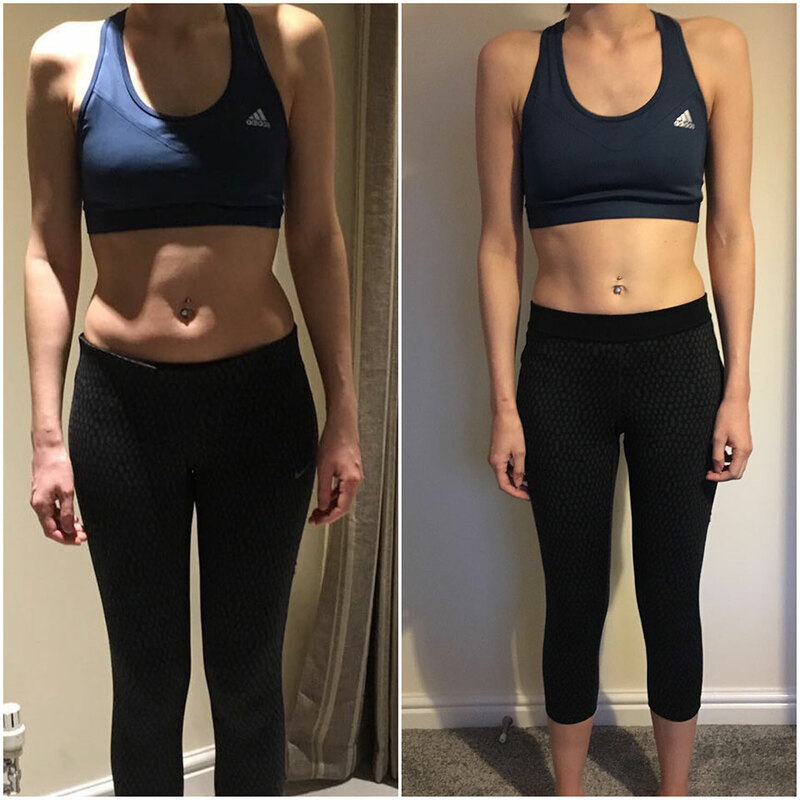 “I first made contact with Karla at the end of 2016 after I had been recommended her by someone, for years I had struggled to put weight on or maintain my weight for long periods of time instead would gain and then lose within weeks. My diet and relationship with food were good, I thought I was eating quality and quantity and I was doing regular classes so was unsure as to why I wasn’t able to gain or maintain! I wanted nothing more than to weigh more than I did. I eventually took the leap and decided to go down the Personal Training route. I was recommended Karla by someone, so I made contact with her at the end of 2016. We sat down and I explained to her what I wanted to achieve. We got the ball moving, paperwork completed and began my sessions. I am now 5 weeks into training with Karla, I meet with her once a week and then do my other 2 days myself as well as weekly check-ins. Karla designed a Nutritional Plan for me so I am now eating the right foods and macronutrients, at first I did struggle to get on with some of the foods but I spoke to her and she adapted it and now I am loving my new plan and enjoying the amount of food I can eat. I have noticed a difference already and gained 2lbs within the first 2 weeks – yes I know that doesn’t sound a lot, but for me, that’s a big achievement and something I’m proud of! Family and friends have commented on how well I look, and the most important factor is I feel so much better within myself. Thanks Karla for being an inspiration – you certainly took on a challenge when I came along ! 60 – Obese- got problem feet AND set in my ways – I now drink water courtesy of my `Karla` drinking bottle – am down 15 lbs so far and you just keep me going – you don t look down on me because Im `fat` – as my trainer you are so dedicated and focused on my body – your just amazing !! You cope with my `fads` and make me want to do better each session. – l hope you will continue and see the finished result !! Karla has been my personal trainer since the beginning of January, she is a great motivator, very dedicated, reliable and remains attentive throughout the workout ensuring maximum benefit from each exercise. This is my first experience of having a personal trainer, although I have kept fit by running for many years. Since training with Karla my shape has improved massively, my knees which were showing signs of arthritis from years of running have improved, my posture is much better and my overall well-being is improved. I would absolutely recommend Karla if you are looking for a dedicated personable personal trainer to change your body shape, improve your motivation, strength, stamina and overall well-being. Karla is one of the best personal trainers I’ve ever had, she has amazing passion, dedication and knowledge of training and nutrition. She doesn’t just train you in the gym she is always on hand and supports you through the highs and lows of your new lifestyle. I’m lucky that I can now count her as one of my friends.